WASHINGTON (CNN) -- Allowing North Korea to develop nuclear weapons would destabilize Asia and threaten the world, President Obama said Tuesday after meeting with South Korean President Lee Myung-bak. 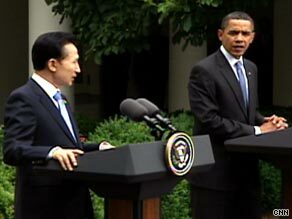 South Korean President Lee Myung-bak and President Obama met Tuesday at the White House. Obama reaffirmed the U.S. alliance with South Korea and said North Korea, which is under U.N. sanctions for its efforts to start a nuclear program, could join the community of nations by dropping all nuclear ambitions. "There is another path available to North Korea, a path that leads to peace and economic opportunity for North Korea," including full membership in the community of nations, Obama said. The two presidents met in a closed-door session and then spoke to reporters before going to a working lunch. North Korea's recent nuclear and missile tests, along with statements about strengthening its nuclear capabilities, prompted the U.N. Security Council to tighten sanctions on the reclusive communist country last week. A unanimous Security Council resolution banned arms shipments to and from North Korea, and Vice President Joe Biden said the United States would enforce the resolution. North Korea protested the resolution by saying it would enrich uranium and weaponize plutonium, according to KCNA, the state-run North Korean news agency. When enriched to a high degree, uranium can be used as weapons-grade material. Plutonium can be used in atomic bombs. Obama and Lee committed their nations to working with U.N. allies including China, a North Korean ally, to enforce the Security Council resolution. Also Tuesday, Japan banned all exports to North Korea, a measure designed to bolster the U.N. resolution, a government statement said. Both leaders said the unified international response to North Korea's acts showed a break from the past pattern of compensating the North Koreans after belligerent or threatening behavior that provoked a crisis. "We are going to break that pattern," Obama said. Tonight on AC360° the families of Laura Ling and Euna Lee speak out. Obama made no mention of two American journalists sentenced this month to 12 years in prison in North Korea on charges of illegal entry and harming the state. However, Lee called for the release of Laura Ling and Euna Lee of California-based Current TV, as well as a South Korean worker he said was being held for unknown reasons. Despite North Korean threats to consider any attempts to halt its ships an act of war, Lee said South Korea's alliance with the United States prevented any immediate risk of an attack by North Korea on his country. "They may wish to do something, but they won't," Lee said. Also Tuesday, a Senate Armed Services Committee hearing was told that Pentagon plans to cap the number of ground-based missiles in Alaska and California would leave sufficient defense against any present threat from North Korea or Iran. Under the budget proposal for missile defense now under consideration, the number of armed silos would remain at 30, with 14 more missiles being developed for testing and to replace older missiles currently in the silos, Deputy Defense Secretary William Lynn said. "At the current time and into the immediate future, we think 30 silos and 44 missiles is sufficient for the threat we face," he said.